^ John B. Wolf. France, 1814–1919 (1963). p 253. ^ Columbia Encyclopedia – "Napoleon III". Sixth edition (2004). Columbia University Press. ^ Bresler, Fenton. Napoleon III: A Life. London: Harper Collins. 1999: 20. ISBN 0-00-255787-8. ^ 5.0 5.1 MFEM Bierman. Napoleon III and His Carnival Empire. St. Martin's Press, New York, 1988, ISBN 978-0-312-01827-6. ^ Poore, Benjamin P. The Rise and Fall of Louis Philippe, Ex-King of the French. London: W.D. Ticknor & Co. 1848. ^ Unknown. The Visit Deferred. The New York Times. 1 January 1855 [1 May 2009]. ^ Mark Almond. The Springtime of the Peoples. Revolution: 500 Years of Struggle for Change. De Agostini. 1996: 96. ISBN 1-899883-73-8. ^ Frank H. Cheetham. Louis Napoleon and the genesis of the Second Empire: being a life of the emperor Napoleon III to the time of his election to the presidency of the French Republic, with numerous illustrations reproduced from contemporary portraits, prints and lithographs. John Lane. 1909: 26. ^ Roger Price. Napoléon III and the Second Empire. Psychology Press. 1997: 16. ^ John Stevens Cabot Abbott. The history of Napoleon III., emperor of the French. 1873: 418. ^ Ronald Aminzade. Ballots and Barricades: Class Formation and Republican Politics in France, 1830–1871. Princeton University Press. 1993: 299. ^ John Andrew Frey. A Victor Hugo Encyclopedia. Greenwood. 1999: 20. ^ Robert Tombs. Nicolas Sarkozy and France, May 2007: a historical perspective. History & Policy. May 2007 [27 May 2009]. ^ Abun-Nasr, Jamil M. A History of the Maghrib in the Islamic period. Cambridge University Press. 1987: 264 [10 November 2010]. ISBN 0-521-33767-4. ^ Jamil M. Abun-Nasr. A History of the Maghrib in the Islamic Period. Cambridge U.P. 1987: 264. ^ Desmond Gregory. No Ordinary General: Lt. General Sir Henry Bunbury (1778-1860) : the Best Soldier Historian. Fairleigh Dickinson U.P. 1999: 103. ^ Taylor, Alan J. P. The Struggle for Mastery of Europe. Oxford, U.K.: Oxford University. 1954: 412. ISBN 0-19-881270-1. ^ Jones, Howard. Crucible of Power:A History of American Foreign Relations to 1913. Lanham, Maryland: SR Books. 2002: 212. ISBN 0-8420-2916-8. 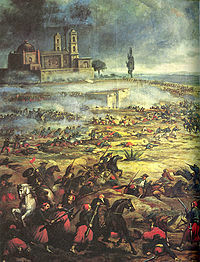 ^ Philadelphia News Article reporting Mexican were outnumbered 2-to-1 互联网档案馆的存檔，存档日期2009-05-11. The Bulletin: Philadelphia's Family Newspaper, "Cinco De Mayo: Join In The Celebration On The Fifth Of May", 7 May 2009. By Cheryl VanBuskirk. Retrieved 5 June 2009. ^ PBS Reports French Army Knew No Defeat for Almost 50 Years. Retrieved 6 February 2009. ^ Bertrand Taithe. Defeated Flesh: Medicine, Welfare, and Warfare in the Making of Modern France. Rowman & Littlefield. 1999: 29. ^ Napoleon III Quotes. Bartleby.com. [6 March 2008]. ^ French seeking emperor's corpse. The Daily Telegraph (London). 9 December 2007 [6 March 2008]. 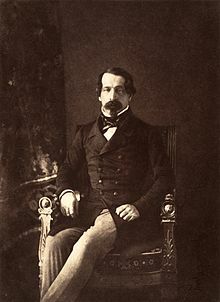 ^ NAPOLEON III (1808–1873). English Heritage. [2012-10-23]. ^ 50.0 50.1 50.2 Betty Kelen. The Mistresses. Domestic Scandals of the 19th-Century Monarchs. Random Hours, New York (1966). ^ David Baguley. Napoleon III and His regime. An Extravaganza. Louisiana State University Press (2000), ISBN 978-0-8071-2624-0. ^ Les enfants de Napoléon et Eléonore Vergeot. Société d'Histoire du Vésinet. [6 February 2008]. （原始内容存档于2011年6月9日） （法语）. ^ Stephen E. Hanson. Post-Imperial Democracies: Ideology and Party Formation in Third Republic France, Weimar Germany, and Post-Soviet Russia. Cambridge UP. 2010: 90.